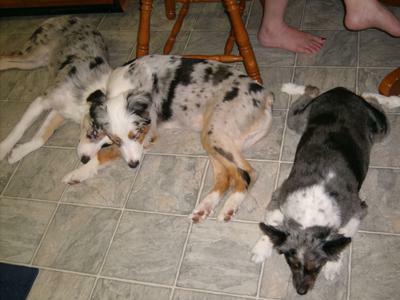 I currently own three Australian Shepherds. They are the light of my life. I don't know what I would do without my babies! All three stick to me like glue. We keep all of them shaved since they live indoors, and since its hot year-round. They all ring a bell hanging from our sliding glass door when they have to go outside. My first is a Mini Aussie named Chica whom we've had since she was a puppy. She's definitely the queen of the house. At eight years old, she just loves bossing around my other two pups. She'll play ball all day long and before she developed arthritis, she could do flips with the best of 'em. 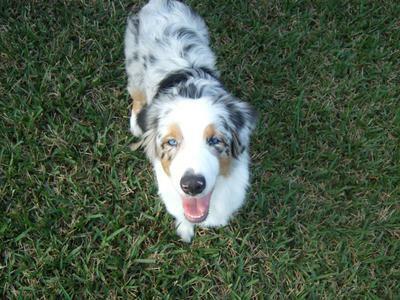 My second is a full-size, eleven month old Aussie boy named Taz. Boy does his name fit! I've never seen a dog who can lay down and utterly destroy 'indestructible' toys in minutes. This dog has some crazy powerful jaws. In addition to that, he has the most energy I have ever seen. He just doesn't get tired...EVER. He was the reason we got a third dog, because playing with other dogs was the only way to truly tire him out so he'd leave us alone and give the fetch game a rest. He's a big goofball though. He loves going for walks, playing fetch (ALL day long), and his new-found passion is frisbee. He seeks out my feet and will lay there as long as I'm sitting. My third is Taz's littermate, Jett. We rescued Jett from an awful life. In searching for a playmate for Taz, we called the breeder we purchased him from and asked if she had any of his siblings left. She didn't, however she said she had some Heeler pups that she'd be happy to let us choose from. We were all set to get a pup when she sent us a photo of this gorgeous Aussie and told us this was one of Taz's brothers and we could have him if we wanted him. Her son had previously owned him but he'd just had a baby, had no time for him and didn't want him. When we went to pick him up, I've never felt sorrier for a group of dogs. There were Aussies and Heelers everywhere. Matted, itchy, ill. The breeder's son had named the dog 'Big Mac Attacka'. After having him for six months, this dog didn't even know his name. When we brought Taz out of the car, 'Mac' stuck to him like glue. We took him home, gave him a bath and took him to the groomers and the vets the next day. He had worms, a skin infection, a horrible scab on his back and the other dogs wouldn't let him eat. We've had him for over two months now and he's as healthy as can be. Besides being malnourished and needing to put some meat on his bones, Jett is in wonderful condition. Our vet said that over time he'll develop the silky soft hair of our other two dogs. Jett is as big of a goofball as Taz. They're attached at the hip. Even Chica has accepted him. We named him Jett because his little ears stick out to the sides of his head and make him look like he's ready for takeoff. The boys play frequently, and now even our old girl Chica gets in on the fray. They love chasing frisbees, with Jett bounding at it like a gazelle, Chica stealing it from them, and Taz just being excited to have someone throw something for him. The thing I love most about my Aussies is having them as a welcoming committee when I come home or get up in the mornings. Its a dog pile in the floor on those occasions. I'm in love with my Aussies and anyone who has an Aussie is an instant friend. These dogs are the best! I just purchased a minature austrlian shepherd that I have no idea how to deal with. Sadly it wasn't my idea to have this dog, he's two yrs old and a family member thought I needed a dog and traveled a ways to get him. The breeder hasn't been very good about giving much information and this sweet little boy only wants to be around me and does not anyone around - he growls and is very protective. 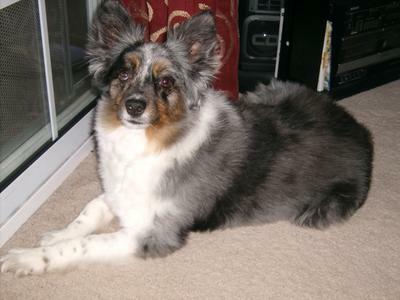 I would very much like to see if there's someone who would like to have this beautiful smart dog that has other aussies and understands them. I can't deal with the growling and watch dog in him. I think he misses the company of his other dogs or maybe not. I'm at a loss as to know what to do. He was a show dog as a puppie is what the breeder told my son but I don't know. He is very well mannered and seems to be very smart. Thanks for any advice. What an adorable crew. 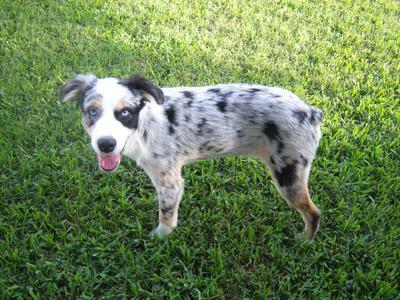 There are definitely times I wish we had a playmate for our Aussie, but we haven't taken the plunge yet. Your dogs sound awesome. Your Aussies are very lucky to have someone who appreciates their nature. I agree Aussies are the greatest. I'm wondering... did you report the kennel you got the 3rd pup from as being substandard? Sounds like there were a lot of other dogs in need of rescue. Hopefully there is a law against mal treatment of animals and puppy mills where you live. I have one mini Aussie Cody that will be 8 years old next Sunday and he is the love of my life. I just lost a Aussie/Border Collie in May to bladder cancer and I miss her so much. I also have an Aussie cattle dog who is 10 years old. All your pups are dolls! We have 3 also. We got our 2 pups when we lost our 12 yr old Matie in Jan.. We had his sister too and she was so lonely. After she decided she would keep the pups (Gibbs and McGee) she has been a wonderful big sister. God blessed us with our Aussies. They are a special breed! Your babies are so cute! We have three girls and recently adopted our boy Ace. They are amazing dogs!